Candice Woon, EARTHCARE Eco Kids Facilitator feeds a male breeder goat at Ol' Freetown Farm. 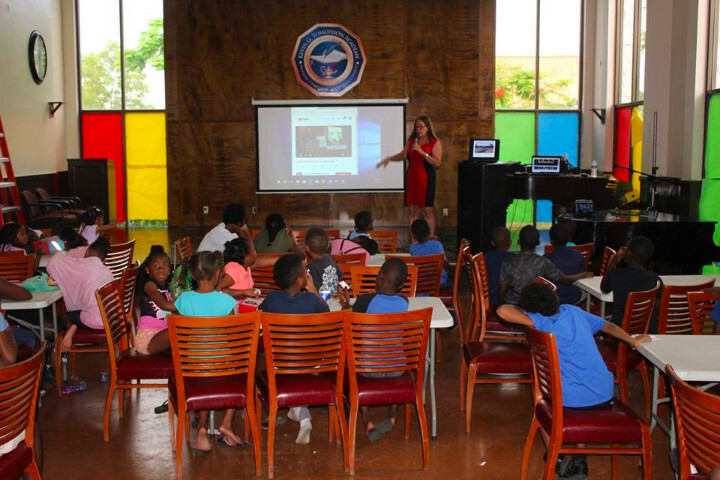 FREEPORT, Grand Bahama – One again on July 3rd, EARTHCARE presented to summer campers attending the ICAN Summer Camp at the Kevin Tomlinson Academy. Bahamian Environmental issues: Pollution, Climate Change and Sea Level Rise were the focus. Gail Woon, EARTHCARE Founder was happy to present to the campers. “At the end during the question and answer period, a young man from the back of the room came up to ask a question. It was, “What are fossil fuels?” I asked the group if they knew what dinosaurs were. Many raised their hands. I asked them if they had seen the movie, Jurassic World. All of their hands went up enthusiastically. I explained that the term fossil fuel refers to the remnants or fossils of the dinosaurs that over a long time turned into oil reserves underground. The students were very interested to hear about how air, water and ground pollution are impacting our lives in The Bahamas, specifically how the pollution generated by other countries is causing problems for this low lying country. EARTHCARE Eco Kids learning about Abaco Boars from George Johnson of Ol' Freetown Farm. Topics presented this summer include: Ground, Air and Water Pollution, Solid Waste Management (burning refuse versus a properly lined and managed Landfill), Oil Spills, Industrial Mining, Coastal Habitat Destruction, Endangered Sea and Shore Birds, Sea Level Rise, Turtles, Sharks and Kids Who make a Difference. 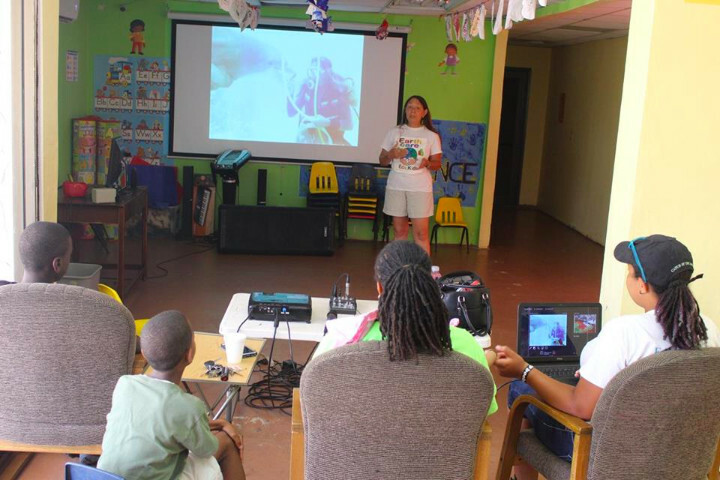 On July 7th, the EARTHCARE Eco Kids learned about Humane Treatment of Animals. Ms. Woon presented about a wide variety of animals found in The Bahamas. We discussed various types of animals, and the implications for wild animals that become entangled in improperly disposed of waste. 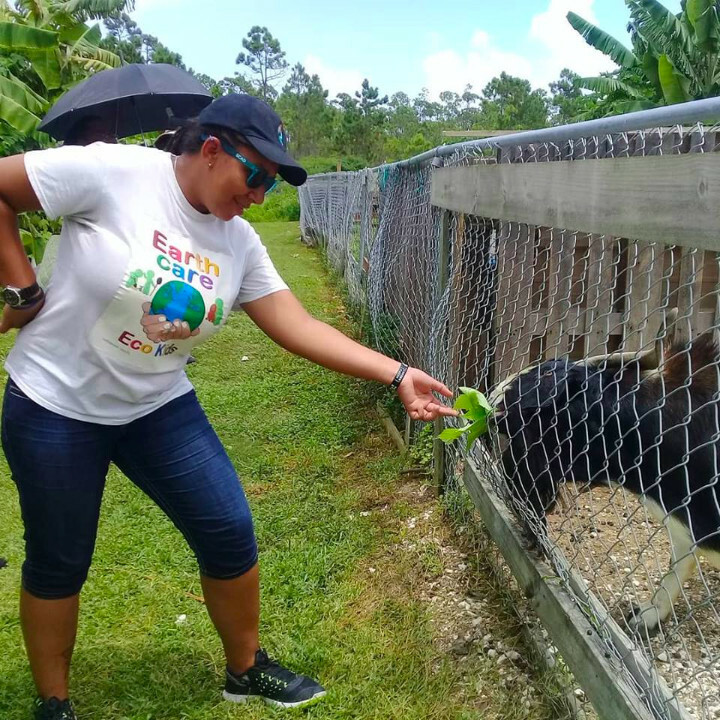 Our EARTHCARE Eco Kids will learn about mangroves, pollution, habitat destruction, sustainable fisheries, climate change, invasive species, shark conservation & research, and on this day, the humane treatment of animals. 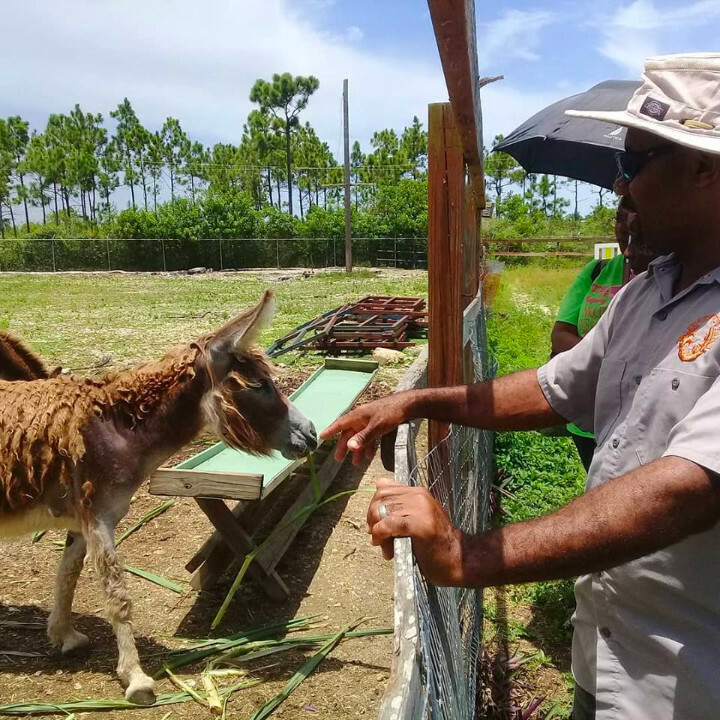 George Johnson, Veteran Farmer, Ol' Freetown Farmer teaches EARTHCARE Eco Kids about the Inagua Donkeys. Gail Woon shared her experiences as a Dolphin Trainer on Grand Bahama and the many reasons why she is now an Anti-Captivity Advocate. Dolphins in the wild can travel up to 40 miles a day, dive as deep at 30 feet or more and most live in family units that remain together for a life time. The world-wide thirst to see dolphins and whales in tanks has caused these self-aware beings to have to live under inhumane conditions as “slaves” to make their “owners” large sums of money. The Taiji drive hunt that is featured in the Oscar winning film, “The Cove” has made the world aware of the captive industry’s “dirty little secret” as well as the multi-award winning film, “Blackfish” which has enlightened many more on the horrors of marine mammal captivity for Orcas. Gail Woon, Founder, EARTHCARE addresses ICAN Summer Campers on Pollution, Climate Change and Sea Level Rise at Kevin Tomlinson Academy. Following the presentation the EARTHCARE Eco Kids made their way to Ol’ Freetown Farm where the students learned about the many different animals there. George Johnson, a veteran farmer, gave an educational tour. 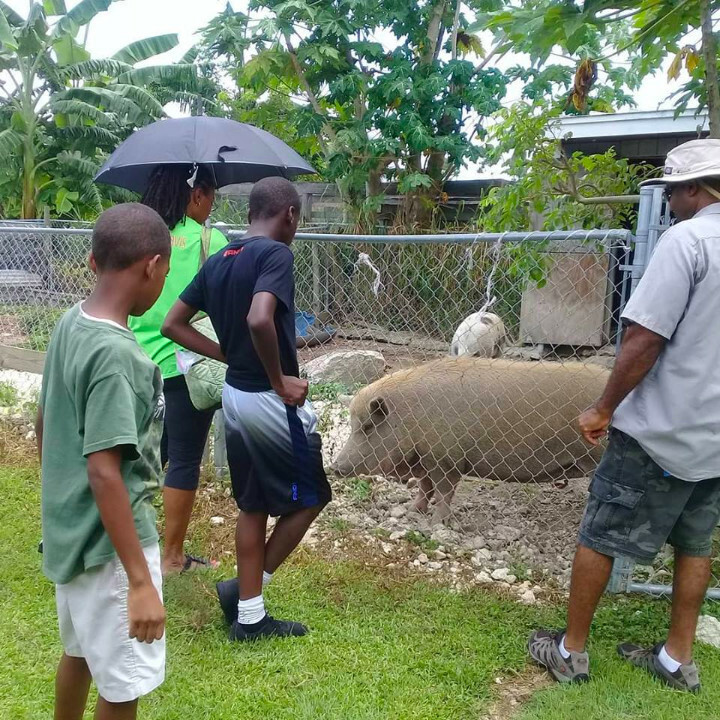 The students were amazed by the many animals on the farm including a pot-bellied pig named Patches who was hand raised as a family pet, many different varieties of chickens, turkeys, peacocks, rabbits, guinea pigs, Inagua donkeys and Abaco boars. George’s wife, Sissel Mosvold-Johnson orchestrated the horse rides for the students and grown ups. Mr. and Mrs. Johnson are committed to the proper treatment of animals and firmly believe that educating our children on their methods of farming, that our youth will be mindful of practices that are environmentally and animal friendly when making choices about what they eat and how they treat animals. At Ol’ Freetown Farm fresh organic eggs from free range chickens are available. No hormones or artificial ingredients are used in the chicken feed. The farm grows organic greens and vegetables including bok choy, parsley, beans, broccoli, dill and tomatoes, to name a few. All of the children were very engaged and EARTHCARE is happy to have had the opportunity to interact with them. EARTHCARE Eco Kids would like to thank Kevin Tomlinson, the Kevin Tomlinson Academy Tours, George Johnson and Sissel Mosvold-Johnson of Ol’ Freetown Farm, the parents/guardians and Awesome Without Borders for invaluable assistance. Gail Woon shared her experiences as a Dolphin Trainer on Grand Bahama and the many reasons why she is now an Anti-Captivity Advocate.